The allure of the comeback is enticing for many athletes once they have stepped away from competition. Michael Jordan did it, twice. Brett Favre returned. Curt Schilling did it as well. What do all these men have in common? They never once stepped inside the Octagon. With that in mind, the mixed martial arts world should be thankful that Georges St. Pierre stepped away from the sport the way he did, and hope that he stays away. GSP’s return continually comes up in the rumor mill. His appearance at UFC 196 sparked chatter that Conor McGregor was going to call him out or that the former welterweight champion was there to announce his return. Neither of these events occurred. Since then, both Firas Zahabi and Renzo Gracie weighed in on whether St. Pierre will return to the cage. Both of the MMA coaches gave responses that have caused further speculation about a return. "A champion is not just born. He's forged into it. And Georges has all the tools to become champion again, and for sure, he's now 100 percent healthy...I saw him, he's in unbelievable shape, and for sure he will be announcing soon to be back in the game." These are strong quotes from two men that have direct lines of contact with St. Pierre. However, the Canadian has yet to confirm or deny plans to return to the cage. But a question worth asking is exactly where GSP would fit into the equation, if and when he decides to return. 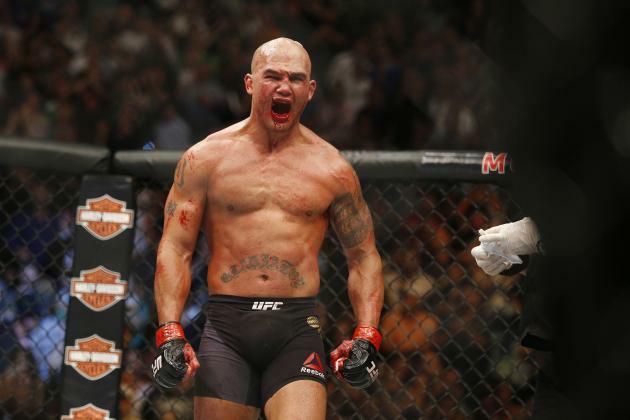 There’s no question that a fight between GSP and Robbie Lawler would be a massive sell for the UFC. Putting these two men against each other in Canada could easily top the biggest events that he’s headlined, such as UFC 158 or UFC 129, which still stands as the largest MMA gate in North American history. But how would St. Pierre fare against this version of Lawler? The champion has defeated men with stronger wrestling credentials than St. Pierre, and his aggression has caused numerous others to wilt under the pressure. Would GSP be able to survive Lawler’s offensive output after nearly three years away from the sport? It would be hard to see that situation ending on a positive note for the former champion. However, there is a way that GSP could easily fit into the equation: “super fights.” The UFC is moving towards a promotional norm based around creating the biggest fights regardless of current divisional rankings. UFC 196 was a product of such a practice. GSP could easily be matched against such men as McGregor, Michael Bisping, or others, in an effort to create fights that excite fans while keeping GSP out of the title hunt at 170 pounds. All parties involved win in this scenario. St. Pierre is booked in interesting fights that aren’t as dangerous to his legacy, the UFC gets back one of its biggest draws, and fight fans can once again see one of the greatest to ever step into the cage. Georges St. Pierre is one of the best fighters in the history of the sport. He walked away on top, which is a rare feat in combat sports. He should only return to competition in scenarios that benefit him. He is not in the business of helping other men make their legacy off of him. Instead, his goal in any comeback should be to further strengthen the legacy that he carved out with 14 years of hard work.